If you follow religious news at all, chances are you’ve heard about the schisms and doctrinal battles happening in denominations like the Anglican Church of Canada and the Evangelical Lutheran Church in America. As these church bodies and others like them continue to move in an increasingly liberal direction (theologically speaking), congregations and individual Christians who make their stand on the Word of God often find themselves to be in the minority and, as a result, often become the targets of oppression from their denominations. Enter an article of mine entitled “Standing Firm: The Cost of Confessing the Word of God” which appears in the most recent issue of The Canadian Lutheran. The article explores some of the difficulties facing Christians who affirm the authority of Scripture, and the sacrifices they often face for doing so. 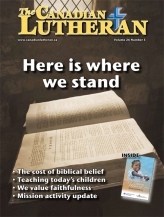 But the article doesn’t focus solely on the negative side of things: it also points out new opportunities for dialogue between denominations who do affirm the authority of Scripture – highlighting, for example, recent dialogue between Lutheran Church – Canada (LCC) & the Lutheran Church – Missouri Synod (LCMS) on the one side and the theologically conservative Anglican Church in North America (ACNA) on the other. It also notes the emergence of dialogue between the newly born North American Lutheran Church (NALC) and the LCMS. And it’s not just my thoughts you hear in the article: three major thinkers were kind enough to share their opinions on the subjects in question: the Rev. Dr. James I. Packer (of ACNA), Bishop John Bradosky (of NALC), and Dr. John R. Stephenson (of LCC). Their thoughts are well worth the read, I assure you. Read it for free online here. I’m very happy to announce what many of you have no doubt already heard: I have recently been appointed Communications Manager for Lutheran Church Canada, and, consequently, have also become editor of The Canadian Lutheran magazine (in print and online). 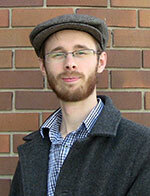 You can read the official announcement (which came out yesterday) over at CanadianLutheran.ca. I begin work officially on November 15. Needless to say, I’m excited to serve the church in so meaningful a way, and I look forward to being part of its public witness to the Good News of Jesus Christ. But – like most things in life – there is a tinge of tragedy in the midst of the joy. I will dearly miss the good friends I have here in Regina (and I’ll be expecting you to come visit me in Winnipeg!). As you can imagine, life is (and will continue to be) pretty busy for me (what with apartment hunting, moving to a new city, learning the ropes of a new job, etc), so updates to this site might be a little sparse over the next while. But fear not, I shall return! Captain Thin is powered by	WordPress 5.0.4 and delivered to you in 0.362 seconds using 33 queries.